I visited my friend and bar-manager Christopher James at Chef Anthony Bucco's gleaming new restaurant named the Ryland Inn, the other day. The Ryland Inn is located in Whitehouse Station, New Jersey. This resurrection of the historic 1700's stagecoach stop is fresh, inviting and ready to spin a culinary web around your thirst and your hunger. Frank and Jeanne Cretella of Landmark Hospitality in Jersey City are the owners of this formerly staid, French-style restaurant, completely recreated with Chef Bucco manning the stoves. It's anything but pretentious here with friendly faces all around and a casual atmosphere that is refreshing and inviting. I sat by the bar for an hour or so recently with a my friend Christopher James and he opened a series of liquor samples I brought for him to play around with. Sometimes the greatest cocktail creations take place with unfamiliar ingredients and flavors. Christopher and I have been friends on Facebook for a while now- bumped into each other in New Orleans during Tales of the Cocktail and you could say I'm a big fan of his creativity behind the bar. He is talented, patient and speaks with a broad smile. 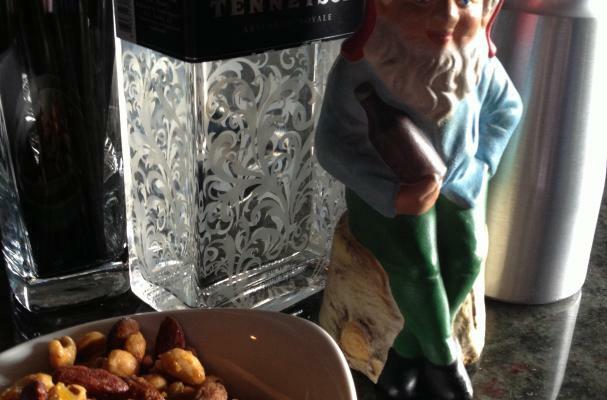 I noticed (as did Klaus, my 1930's German Drinking Gnome) when I sat down, Christopher immediately made sure I had a glass of ice water and some bar nuts made fresh in the kitchen. When a barman takes the time to feed you and hydrate you, the experience at the bar becomes truly a passion. Not just for the alacrity of drinking, but for the whole experience of why we drink in the first place... for relaxation. And the first rule of relaxation is to make the customer, or in this case Klaus and myself- feel very welcomed. A bottle of Tenneyson Absinthe that I brought with me sat in front of us. I say us because the us would be myself and Klaus. Klaus and I just got back from Paris and Burgundy. He is brimming with ideas for paring seasonal foods with the flavors of from the garden. In fact, Klaus developed quite a thirst for Absinthe while on his short trip. Absinthe unlocks your memories and creates new ones with grace and skill. Much like Christopher's comfortable talent at the bar. Tenneyson Absinthe, rolling in at 107 proof- is so easy to work with. The louche is pale blue and the soft, yet potent finish translates itself easily to cocktails using fresh citrus juices with ease! The gin-like nose is wonderful with nothing more than Perrier Sparkling Natural Mineral Water *with pink grapefruit, a lemon peel squeezed into the glass and a bit of Royal Rose simple syrup of Cardamom and Clove. This is a seasonally pleasing combination of flavor and style. I also like to finish my concoctions with Bitter End Bitters for a spicy, umami finish. There is something about this cocktail that just creates thirst, hunger (for Chef Bucco's unique cooking) and passion for an evening to remember at the newest incarnation of the historic Ryland Inn. Klaus is looking forwards towards dinner at the Inn. I hope he can get safely to his table after enjoying a few of Christopher's concoctions at the bar! But he's much smaller than I am, or so I would think! I created a refreshing punch using grilled citrus fruits and un-grilled fruits to raise the level of flavor to one that is both refreshing and also hunger inducing at the same time. Campari is woven with Tenneyson Absinthe with grilled and fresh citrus juices plus some surprises! I call it the Ryland Inn Twist. The twist is the grilled citrus fruits, quite surprising to the tongue! The finish is from the Bitter End Thai Bitters, adding a spicy, bitter kick to the finish of this punch. Ingredients for a couple of punches. Double or triple ingredients for a punch bowl of surprises. Danger level 3 out of 5. Add 2 oz. each of the un-grilled citrus juices. Freshly squeezed is an absolute MUST! Shake Shake Shake Shake Shake! Sip to the success of the great success of the NEW- Ryland Inn! Warren Bobrow is the Food and Drink Editor of the 501c3 non profit Wild Table on Wild River Review located in Princeton, New Jersey. He is one of 12 journalists world-wide, and the only one from the USA to participate in the Fête de la Gastronomie- the weekend of September 22nd. 2012 in Burgundy and in Paris. He attended Tales of the Cocktail in New Orleans in 2011/2012. Warren is a published food writer and former classically trained cook.